I had a few hours free on Thursday afternoon so headed over to Burry Port for the first time in months. My arrival was greeted with blue sky, a blazing sun and plenty of holidaymakers which initially put a dampener on my plans to watch the high tide roost. Fortunately most of the birds were still present, if a little more distant than I would have liked, out on the sand bank between Pembrey harbour and the lighthouse. 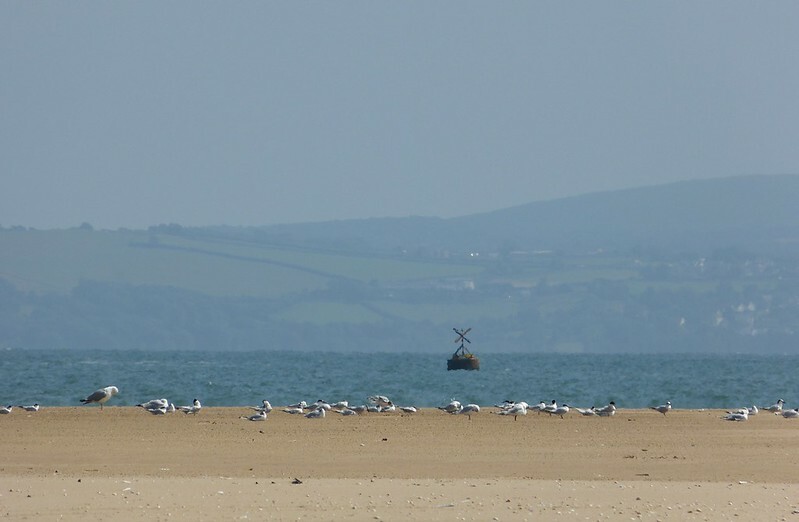 There a large gathering consisted of at least 40 Sandwich Terns, 10 Mediterranean Gulls, numerous Black Headed Gulls, a single Great Black Backed Gull and one drying Cormorant. Even further back a couple of hundred Oystercatchers were quietly roosting, right up until two cyclists appeared and flushed the lot. Unsurprisingly the Terns and Gulls were also disturbed although thankfully they didn't travel far and actually ended up a little closer to my position. A lack of any small waders was slightly disappointing but a Gannet just off Whiteford Point made up for their absence. 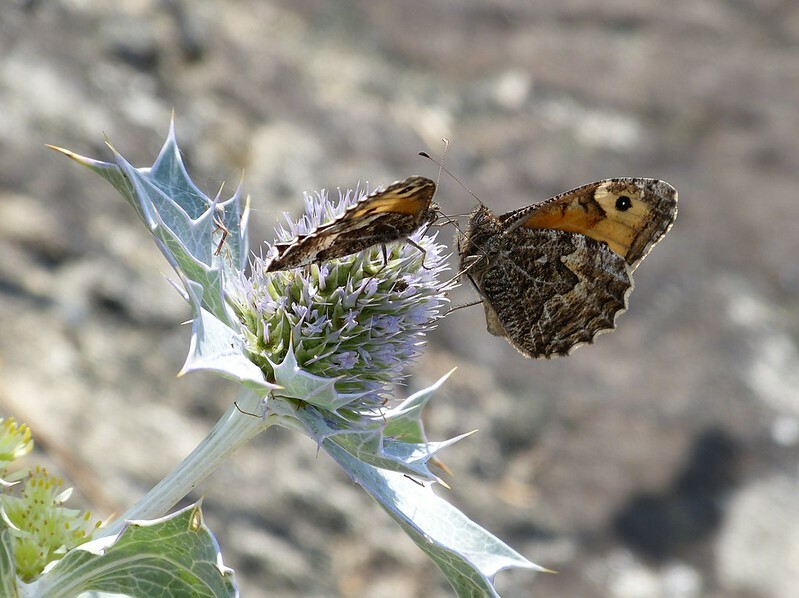 The sun also seemed to have brought out the butterflies with at least three Grayling feeding, and often fighting, over several flowering Sea Holly plants. I'm used to seeing the latter around autumn time so it was nice to see such pristine examples, most of which were centred on the old stone breakwater east of Pembrey harbour. Down on the high tide line there were literally hundreds of tiny Moon Jellyfish scattered wherever I looked. 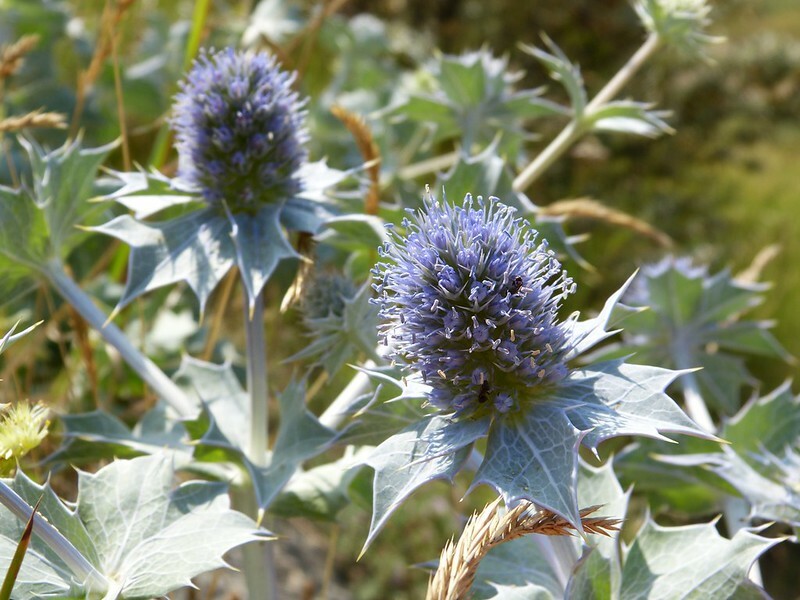 Most had suffered under the unrelenting sun but there were still a few in fairly good condition, one of which is shown below. 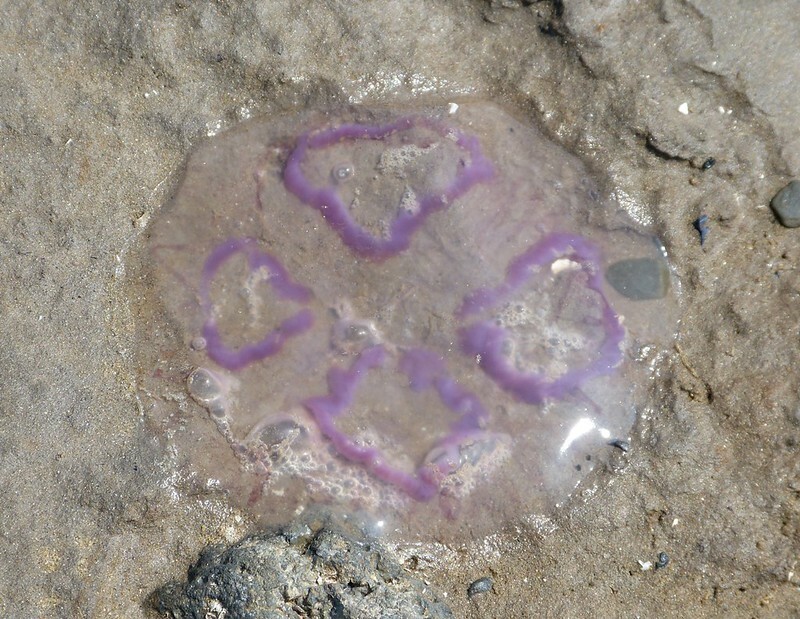 There have been several articles in the national press recently covering a large influx of jellyfish to our waters and I have no doubt that this stranding is just another symptom. It's not the first time and I doubt it will be the last. Good as all that was it was humans who ultimately provided the best entertainment of the day. For those who don't know our local area has the second highest tidal range in the world which means you've got to be a little more careful than usual when it comes to enjoying the sea. 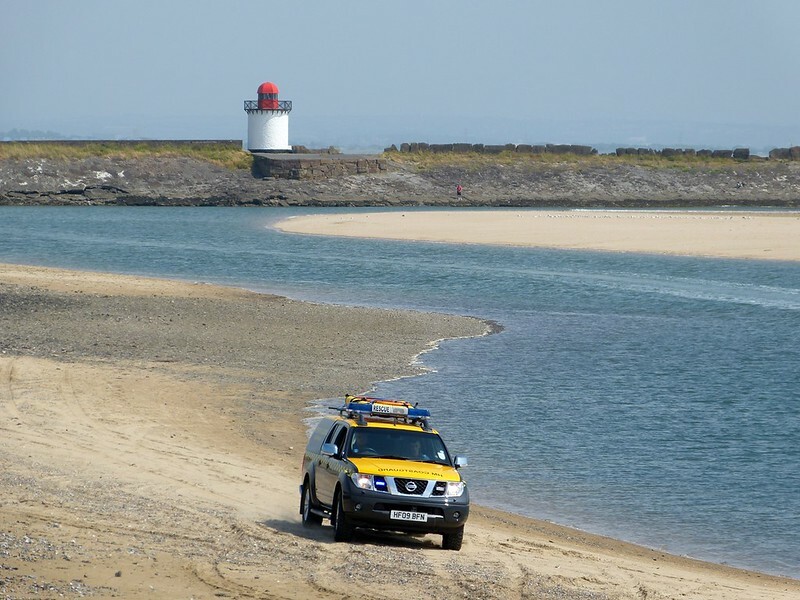 Burry Port is a perfect case in point where large and inviting expanses of sand are cut off in a matter of minutes when the tide starts to rise. 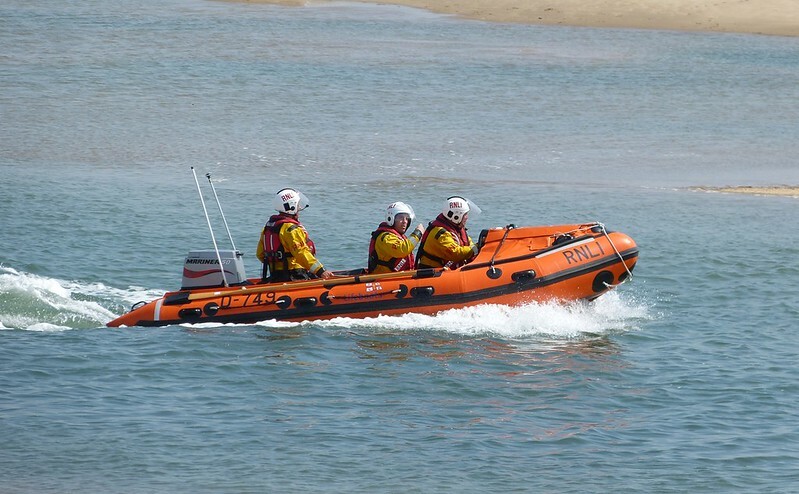 Sadly most visitors don't realise the danger (or simply don't care) and it came as no surprise to see the coastguard and RNLI rescue craft heading along the beach. Sure enough a couple of girls had become stranded but were soon in safe hands thanks to our excellent rescue services. 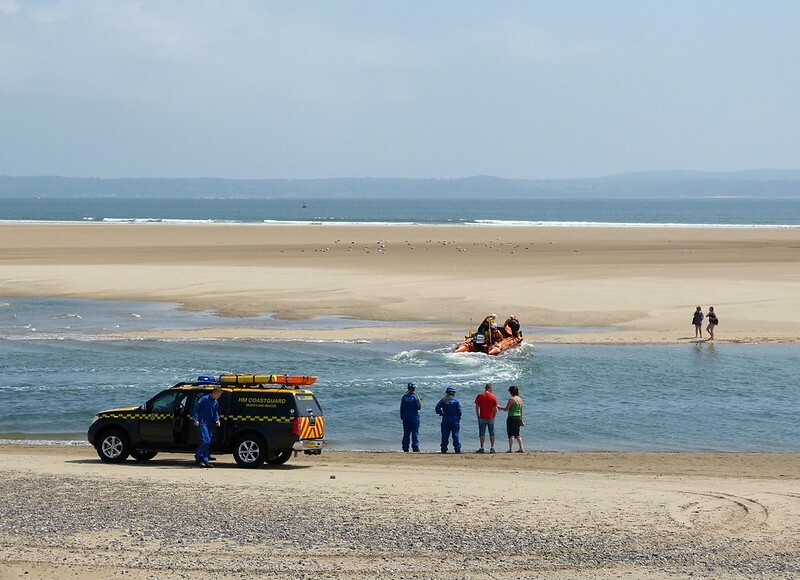 There were another four or five people who were in a similar situation but appeared willing to either wait for the tide to drop or to take the long route back across Pembrey Burrows. Rather them than me that's for sure. I love the Graylings, they are special.